The convoy had been taking fire for a while by the time it came across the first roadside bomb. Maj. Jim Gant knew he could not wait for the Explosive Ordnance Disposal technicians to show up. So he decided that his up-armored vehicle would have to eat the roadside bomb. He also made sure that it would explode on his side. Gant, 41 explained that was his job as a leader. “I need to be where the most danger is,” said Gant, team leader for the Iraqi National Police Quick Reaction Force Transition Team. 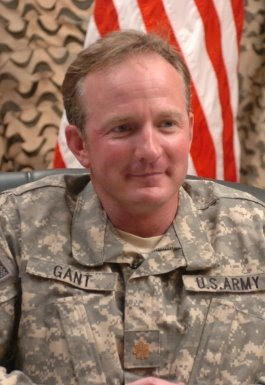 On Dec. 11, 2006, Gant was leading a convoy of Iraqi police commandos from Balad to Taji. Iraqi police had been making regular trips to Balad, and there had been heavy fighting along the route for the past six weeks, said Gant, of Fort Bragg, N.C. This day would be worse. And the two F-16s that were supposed to support the convoy had been diverted, Gant said. About 15 miles from Balad, the convoy started taking heavy enemy fire. Two Iraqi police commandos were wounded — one, shot in the face. Gant said he treated the Iraqi who was hit in the face and got them evacuated. By the time the convoy got to the first roadside bomb, about 30 minutes later, it was taking fire from both sides of the road, Gant said. He knew they had to push on. “If we would have stopped, they would have tore us up,” he said. He also knew that if one of the police commandos’ vehicles ran over the roadside bomb, the results would be catastrophic and would tie down the rest of the convoy. “If that IED is going to hit one of my vehicles, I want it to be mine,” Gant decided. Gant said he had his gunner drop into the Humvee and he positioned the rest of the convoy away from the roadside bomb. Then they drove forward until the bomb went off. The blast “absolutely rocked” the Humvee, Gant said, but everyone was OK, so they kept driving. About two minutes later, the convoy found a second roadside bomb. Again, Gant positioned the rest of the convoy away from the bomb as his Humvee drove toward it. They got closer and closer to the roadside bomb, but nothing happened. When they got between 15 and 20 feet away, the bomb finally went off. Once again, the blast rocked everyone in the vehicle, but otherwise, the occupants were unhurt. As soon as the bomb went off, a machine gun opened up on Gant’s vehicle with bullets hitting the windshield. The fight was not over…. And there is more. Go here to read the rest of these incredible events on that fateful day. That sentence is something that Maj. James “Jim” Gant, who serves as thechief of the Iraqi National Police, Quick Reaction Force Battalion Transition Team, tells his policemen all the time, encouraging them to fight for what they believe in. Though most the time he was talking in generic terms, this time he knew the fight was waiting for them. For six weeks his patrol of three armored high mobility multipurpose wheeled vehicles and 23 “soft-shelled” national police pick-up trucks had been getting in fire fights with an organized insurgent force in an area between Balad and Baghdad. On Dec. 11, his patrol was finally on their way back home. Maj. Gant knew there would be a grand finale. His actions, during that gift, resulted in him earning the Silver Star, which will be awarded on May 3 at a Iraqi National Police station near Forward Operating Base Prosperity. The Silver Star is the third highest award given for valor in the face of the enemy. It is given to American heroes. Maj. Gant knows four Soldiers who have earned Silver Stars; two died for them. He said heroes are everywhere, it just depends on if they get the chance to show it. He was given his change to prove himself on that fateful day in December. The enemy on that stretch of road was well trained and waiting, Maj. Gant said. But he knew his crew was ready. After spending 17 years in the Army, he should know. “I had a really well trained transition team,” he said. That confidence was also extended to his Iraqi brethren as well, with good reason…. “We try to maintain contact with the enemy as long as possible and kill as many as we can,” Maj. Gant said. “We were going to do some serious damage that day. This is when Maj. Gant received word that a woman in the civilian vehicle had been severely injured in the first blast. Still under heavy small arms fire in a hasty perimeter, he got out and tried to perform first aid on her. She then allowed him to apply tourniquets to both of her severely wounded legs. There was also a little girl in the vehicle. Gant, a family man with two kids of his own back in North Carolina, Tristen, 9, and Scout, 7, wanted to keep this child safe. “I realized that we might all die today, but this little girl will not,” he said, talking about how he put the child in his up-armored vehicle. “We had some sporadic small arms fire after that, but we had broken their back. They wanted us to stop there. When they finally made it back that day, they were met with a celebration. There were more than 200 Commandos singing and bathing the road with goat’s blood and planting bloody handprints all over there war-torn, bullet-ridden vehicles. There were celebrating. Though nearly six months has passed since that battle occurred, Maj. Gant can tell the story of the battle like it was yesterday. Only two Soldiers remain on his crew that were with him that day, most of the American Soldiers have rotated back to the United States, but he remembers all of his team. and the heroic acts by all involved in that day. Thank YOU for your service, Major Gant.